The deformation of metal seals can be reduced or even virtually eliminated by utilising the DuPont Kalrez perfluoroelastomer (FFKM) O-ring seals. The Kalrez® O-ring seals are available in the UK from authorised distributor Dichtomatik Ltd. 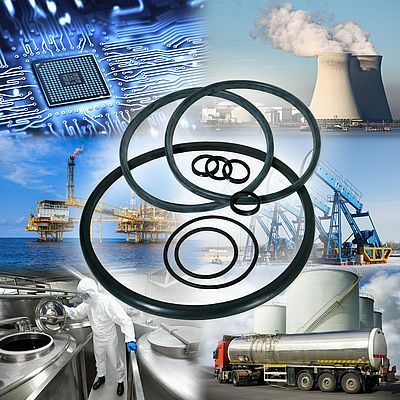 Finished O-rings, custom shapes, sheet and cords are manufactured exclusively by DuPont from raw material right through to the finished products, and Kalrez is now the choice of elastomer for demanding sealing applications. Kalrez perfluoroelastomer is resistant to over 1800 different chemicals while offering the temperature stability of PTFE (327°C). The advanced properties of the product help maintain seal integrity with increased production safety, while also helping to minimise manufacturing and maintenance costs. Typical worldwide markets that can benefit from the proven advantages offered by Kalrez® products include aggressive chemical processing, food and pharmaceutical production activities, oil and gas recovery, petroleum applications, power generation together with semiconductor wafer processing involving a wide range of industrial and electronic grade chemicals. Subsequent removal or in-situ repairs of affected equipment such as gear pumps, centrifuges, reactors and quick-release couplings can be expensive, particularly if the MTBF times are of short duration, leading to high unscheduled costing levels together with production shut-downs and process liquid losses. Labour costs alone covering major component strip-downs or complete unit replacements can be very substantial.